advanced bend measurement systems on the market today. Virtually eliminates climbing on the pipe. Continuous readout of the bend to 1/10 degree. Keeps the work moving - no need to stop to measure bends. 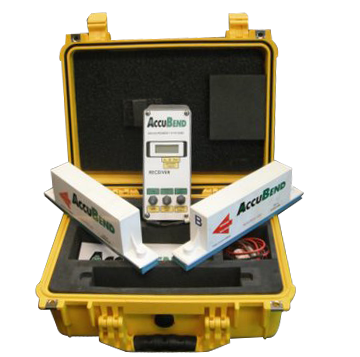 AccuBend measurement system consists of two transmitters and one receiver. The receiver is mounted at the operator's stand. Once the transmitters are set on the pipe, the angle of the bend is continuously displayed. In the normal operating mode, the receiver computes the net bend in the pipe, regardless of any bending machine incline. Serialized radio frequencies allow more than one set to work in the same area without interfering with each other.